As I was leaving Mexico Point Park which lies twenty miles east of the City of Oswego, New York, on a peninsula along the Lake Ontario shore over the weekend, I noticed a sign pointing to a trail leading off into the woods. The sign said the trail would take one to Spy Island. I could not pass up the chance to find out the story behind such a location. The forest trail afforded a cool walk as the trees have fully unfurled their leaves soaking up the sunshine and producing food while releasing life giving oxygen. I walked past small glades dotted in yellow, red, pink and blue wildflowers. After ducking under a fallen tree and going across a man-made walkway between a marsh on the left and the Little Salmon River’s outlet to Lake Ontario on the right, I arrived on Spy Island. A short climb brought me to the top of a clearing in the mature woods and the reason for the island’s name. New York State Education Department historical marker at the grave site of Silas Towne at Mexico Point Park near Oswego, New York. NIkon D700/28-300VR, 1/80s, f/4.5, ISO 200, EV 0, 28mm focal length. 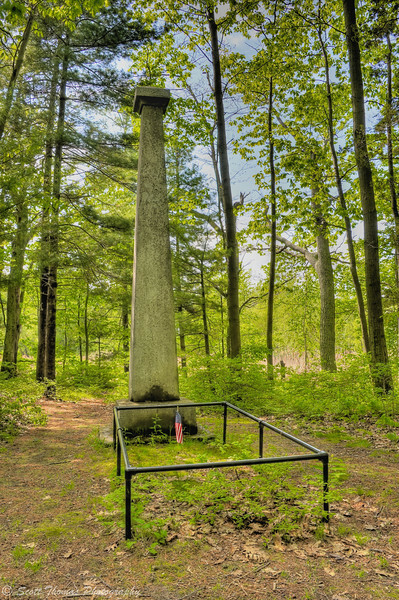 The grave site of Silas Towne is protected by metal tubing and marked with a fifteen foot limestone shaft. A New York State Education historical marker informs people curious enough of follow the trail of Mr. Towne’s daring exploit during the American Revolutionary War. After Silas overheard the plans from this location of British Brigadier General Barry St. Leger to move on Fort Stanwix near Albany, he braved the fifty miles (80 km) of wilderness to warn the rebels. The British were defeated in the Battle of Oriskany on August 6, 1777. This put a stop to the British plan to squeeze General Washington’s army who were stationed on the New Jersey side of the Hudson River at the time. Silas continued to spy for the American army taking on assignments along the St. Lawrence River and reporting back on any British and French activity along the northern New York water border. After the war, he returned to the Mexico Point area and settled. Thirty years later and dying at the age of 51, he told a friend to bury him on the island which he was in 1806. Towne was mostly forgotten except in local folklore until July 4, 1871 when the limestone shaft was dedicated to the “memory of Silas Towne, an officer under Washington.” Today, due to the stone being limestone, it is hard to read the dedication with erosion from rain and lichen and mosses breaking away at the stone. It is a quiet place just as I imagine it was the night the tall, lithe Silas slipped away from the British to become a part of history. 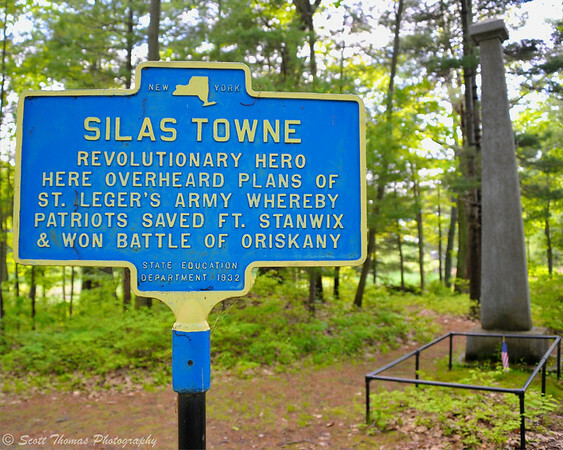 The grave site of Silas Towne, a Revolutionary War Hero, at Mexico Point Park near Oswego, New York. Nikon D700/28-300VR, f/11, ISO 200, EV 0, 28mm focal length, HDR Image. Fittingly, on this Memorial Day weekend, someone had placed a new American flag in honor of Silas Towne’s service to a very young United States of America during a time when heros came from unexpected directions. As I looked upon Mr. Towne’s grave, I gave thanks to him and to all the patriots of the Revolutionary War who fought for the freedoms I enjoy 235 years later. This entry was posted in Weekly View and tagged american revolutionary war, flag, grave, hero, historical marker, history, holiday, island, Lake Ontario, memorial day, mexico point, new york, oswego, park, silas towne, spy. Bookmark the permalink. I think I, too, could not have resisted finding out about a place called “Spy Island.” Sounds like a wonderful place for a walk and a little history lesson! I know…the pull of that name was just too much to resist. So glad I didn’t. Very interesting find. I would have had to check out a place with that name too! Thank you, Robin. I guess my last assignment was still fresh in my head when I came upon the grave site. I love this post, not only you found a peaceful and lovely place on your walk – you also found a historic spot with an interesting story. And I agree – it is very important to remember, how so many people before us have fought for the good life many (but not all – yet!) of us in our parts of the world have today. Agreed, good to thank those who came before and are currently serving to keep us free. Also, good to remember those people still struggling to find a voice and a place to be free. Visited this place – Mexico Point Park – a few days ago to find the letterbox near the monument and have a picnic at the lakeshore. Nice walk thru the woods, tho the bridge to Spy Island is deteriorating. Noted the sassafras aong the path, with its mitten-shaped leaves, and a young American chestnut, as well. Neither of these is especially common, the latter scarce because of disease. Just left the site. Very nice spot, as you described. Were you able to fine out any other info on Silas Town(e) or any other details about the actual spying incident. Were the British forces plotting in the woods outside while Silas was fishing for trout at the creek nearby. I am going to see if I I can find out anything more about the man and the event which brought him into American History. This is a story of spying aiding the fledgling Republic, now those in power spy on our every move. Was at the site with the family this afternoon. It is amazing to be in a spot were the history of our nation took a pivotal turn because of the heroic efforts of one man. One man, can, make a difference.